As her beautiful, self-assured image flashes across the TV screen, model Annabel Greene is the ideal 17-year-old girl-just crowned prom queen, escorted by a handsome hunk, and smiling broadly. But the glitter of Annabel's commercials is a far cry from the reality of her life. Her sister suffers from anorexia, her mom struggles with depression, and Annabel is a social outcast hiding behind a cheerful facade. And then she meets eccentric Owen Armstrong. Can this music-obsessed youth with his fervent commitment to truth convince Annabel to reveal a dark secret and bravely confront reality? Garnering five ALA Best Book for Young Adult honors and two School Library Journal Best Book of the Year selections with her first five novels, Sara Dessen has taken the young adult world by storm. 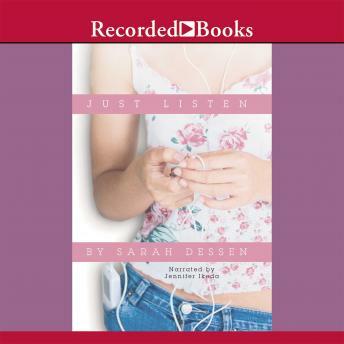 In Just Listen, Dessen delivers the bittersweet story of a dissatisfied model and the offbeat guy who teaches her that only truth can set her free.